How to import to Nepal? What are the import procedures in Nepal to move goods? Explain about import registration process, cargo movement to Nepal from overseas countries, Import delivery process in Nepal etc. Detail the import methodology in Nepal. This post explains about step by step procedures that need to be finished with Nepal government authority for importation to Nepal. If anyone wants to start export or import of merchandise from and to Nepal, is required to have a valid business license in Nepal. Subsequently, also register with VAT. The policy of liberalization allows open imports without a license except for those controlled goods. Department of Customs under the Ministry of Finance dealt in collecting Customs duties, enhance trade facilitation etc. All exporters and importers must obtain the export, import code (EXIM code) which is issued by the Department of Customs of Nepal. The import documents required in Nepal depends up on the regular trade policy of Nepal Government, the nature of goods importing, specific goods importing to Nepal. The documents required for import to Nepal to take delivery of import cargo is also based on the product importing, multilateral, bilateral or unilateral trade agreements, and other trade policies of Nepal government. This post explains about different phases in import process that every importer needs to go through in Nepal. Need to import to Siddharthanagar. Explain to import to Kathmandu. Information to import to Siddharthanagar. 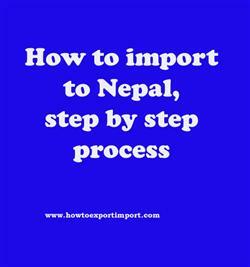 Step by step process to import to Kathmandu. Methods to import to Siddharthanagar. Guidelines to import to Kathmandu Please guide to import to Siddharthanagar. Help to import to. Procedures required to import to Kathmandu. Requirements to import to Siddharthanagar. Clarifications to import to Kathmandu. How can I import to Siddharthanagar. What should I do to import to Kathmandu. How to import to Kathmandu? Formalities for import to Siddharthanagar. Procedures to import to Kathmandu. IGST Act Section 3 Appointment of officers. How to import to India from Tanzania?